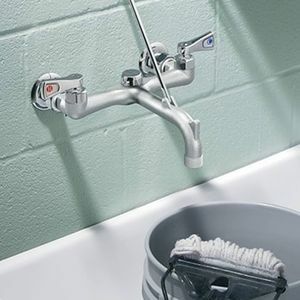 Utility sink faucets - the main difference between these and laundry faucets is that they are threaded for hook-ups. 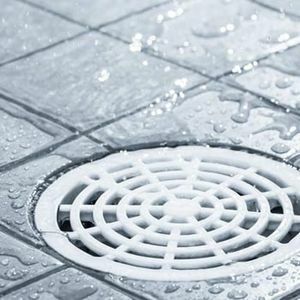 Floor drains - no laundry or utility room is complete without a floor drain. As mentioned, utility rooms can be extremely useful in the day to day running of a home. Providing a useful place to do laundry or even to clean outdoor implements, such as saws, tools, and other items, utility rooms are great for the workman in your family, regardless of the chore that needs to be done. It is also a good place to keep all of the tools that you do not used every single day, like mops, washing machines, and more, keeping your home organized and ensuring easy access whenever you do need said tools. 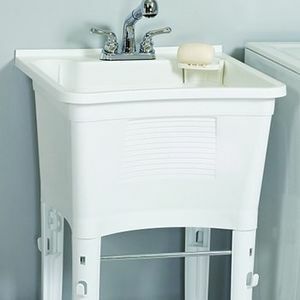 Utility/Laundry Sink: If you are using your utility room for laundry, a laundry (or utility) sink may be an order. These are perfect for clothes that need hand washed, and make it, so you do not have to leave the room when you are doing laundry to deal with those types of clothing. On top of this, a sink like this can also be used to clean lawn tools, as these sinks normally come equipped with extremely deep basins. This makes it easy to clean lawn tools in a controlled space and makes sure that you have a location that is well-equipped to deal with large cleaning jobs. Tools: If you are using your utility room as a work storage space as well, outfitting it with household tools may also be a good idea. And, with utility knives, drills, and a host of other fantastic household tools that are perfect for use around the home, PlumbersStock.com can provide you with the best ones on the market. Laundry Faucets: Clearly, you can find a lot of uses for a faucet in your utility room setting, particularly if the clothes you wash by hand need hot water to wash them properly. And, because this is just one more specialty item that PlumbersStock has in stock, you can find all of the best brands and products here to make sure your laundry room faucet works great for you. In the end, if you are looking for the best utility room products online, PlumbersStock is certainly the place for you to find cheap plumbing supply online. We often offer up to 50% discounts on retail prices, while still giving you some of the best brands on the web, so you do not have to settle. Utility room fixtures like faucets and sinks come in handy, especially if it doubles as a laundry room. Shop and save on wholesale faucets and sinks. Don't forget about replacement faucet parts and sink parts for your installation.